*This idea was submitted by Bethany Tapp, the director of children’s ministries at the United Christian Church of Dubai. For my preschool classes (and for families) I provide a couple of simple songs each month to help drive home the truth of the lessons. These are memory verses or concepts set to familiar preschool songs. 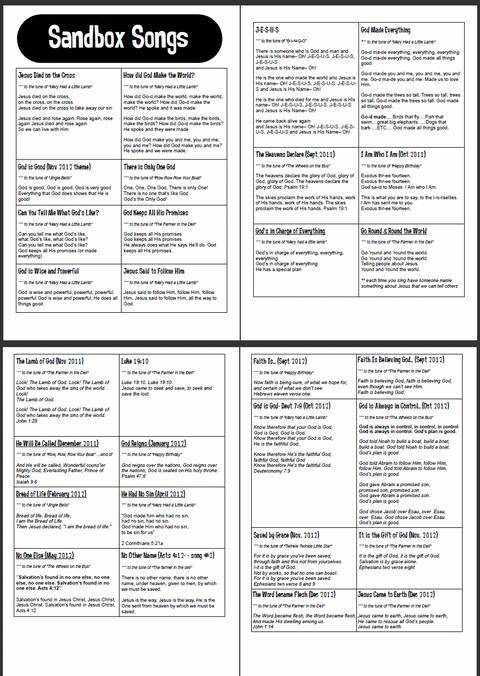 Here are 30 songs that I’ve written to supplement our lessons. I’m happy for them to be shared. Click on the preview below to download the print friendly PDF. You can also leave a comment to tell Bethany thanks for sharing! Thank you for sharing your talent and helping others teach children God’s word. So thankful for this resource! You’re a blessing :)!